Here are a few examples from our sustained campaign promoting Horizon Eye Care’s expanded, cutting-edge LASIK services. 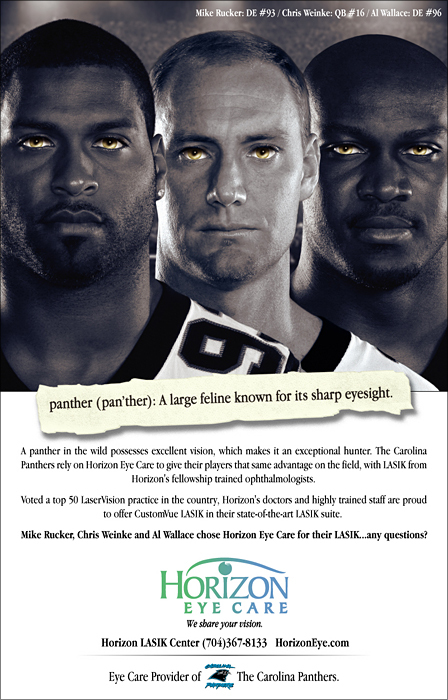 For the print ad, we highlighted their partnership with the Carolina Panthers, using key Panther players who had the LASIK surgery, Starting with a photo shoot with each player, a composite layered ad was created. Note the extensive detail of the Panther eyes on each player. This ad was so well received, it became 10 foot posters inside Panther stadium!